Share your spring and summer outdoor decorating projects and get inspired! I love this time of year when our living space expands outdoors. 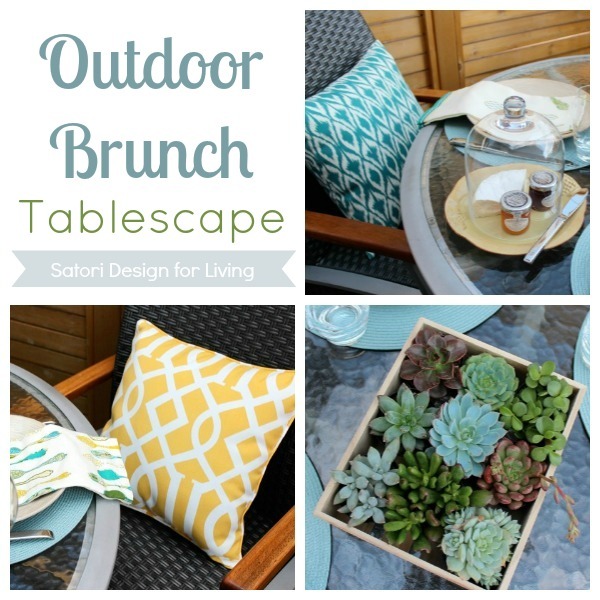 We tend to eat as many meals as we can in our outdoor dining area, and yesterday I shared the new tablescape I created for hosting brunch over the summer season as part of this week’s Outdoor Extravaganza decorating challenge. Outdoor decorating is definitely one of my favourite things to do this time of year. I’ve been inspired to take on a few more projects this summer thanks to the other hosts of this series, Tiffany, Dawn, Barbara and Carmel. Be sure to check out their projects before you link up yours below. Link up as many outdoor plants & flowers projects as you like- old and new. Your project will show up on all 5 blogs! Please include a backlink to this post, and be sure to take a look around and show some blog love. No items for sale please! I’ll be sharing my top Outdoor Decorating project picks over the next week on Facebook and Twitter, so watch for yours! Also, be sure to come back next Wednesday for the Paint Projects Link Party! Love your deck and all the other outdoor inspiration. I’m always looking for new ideas for my yard! My life neeeeeeds more outdoor dinner parties. In fact, throwing a massive outdoor dinner (for like 50 people) is on my bucket list. Likely wont happen this year, but a cute tablescape for four is a good place to start. Wow, there’s some fantastic outdoor projects here!! Thanks for hosting your linky party Shauna and have a wonderful weekend! I am in love with those succulents! Fantastico’ outdoor goodness all around. So glad I came by to visit and thanks for hosting, Shauna. Enjoy your Memorial Day weekend!